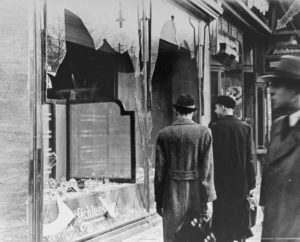 Bishop Patricia A. Davenport shares a pastoral letter on the 80th Anniversary of Kristallnacht, the Night of Broken Glass, in light the murders at Tree of Life Synagogue in Pittsburgh last month and a rising number of hate crimes against Jews. Noting that later-life writings of Martin Luther were used to justify the pogrom, the bishop reminds us of the ELCA’s 1994 repudiation of Luther’s anti-Semitic writings in the Declaration of the ELCA to the Jewish Community. “We pray that God will continue to bless the growing cooperation and understanding between Lutherans and Jews, and we stand with our Jewish brothers and sisters against the scourge of hatred and anti-Semitism directed against them,” the bishop writes. We pray that God will continue to bless the growing cooperation and understanding between Lutherans and Jews, and we stand with our Jewish brothers and sisters against the scourge of hatred and anti-Semitism directed against them. 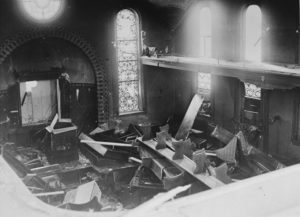 Photo below: “View of the destroyed interior of the Hechingen synagogue the day after Kristallnacht,” United States Holocaust Memorial Museum. View of the destroyed interior of the Hechingen synagogue the day after Kristallnacht.